I fell and broke my ankle. It was a dark, stormy night as I was making my last rounds for the evening. Everyone was dry in spite of the rain; they had plenty of water, hay, and grain; the heat lamps were on because it was supposed to get in the 30s that night. So I was off to fix dinner. While walking through the chicken area, I slipped on a muddy spot and in a flash went down in wet, slippery chicken manure tainted muddy walkway. Ugh … . Luckily my rain slicker protected me from most of the yuck but it wasn’t enough to protect me from the pain of a twisted ankle. I remembered the pain because I first broke my ankle in 1997, same ankle different shoes and slope. 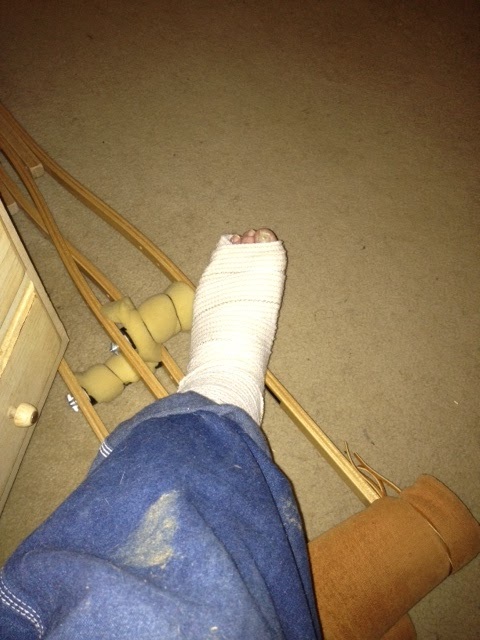 The hubster took me to the ER on Saturday where the x-ray confirmed that my ankle was indeed broken. They put on a temporary cast and I was told go to a bone doctor within 2 days to get a real cast. That happens Tuesday. In the meantime, I’m relearning how to walk with crutches. For those of you who have had this experience, you know the challenges. Sigh … walking is challenging on a level floor but impossible on stairs. Soooooo, with that said and because my factory is 15 steps down in the basement, I can’t get there. Regrettably, I’ll be taking a few weeks off from making my beloved goat milk soaps and lotions. Angels exist! Natalie, who worked with me when she was in high school, is home from Texas Tech for the Holiday break and is coming over to feed all the critters. Thank you, Lord. I knew this because of her Facebook posts. She graciously agreed to come over twice a day to feed everyone, even our new kitten. I just can’t get out of the house right now. Maybe by the time she has to return to school I’ll be able to get outside. AND, the days she can’t be here, our son will be. Angles do exist. Count your blessings and rejoice in their goodness. Happy Holidays everyone. My products are available at God’s Country Outfitters on Hwy 52 in Albemarle, and Falling Rivers Gallery on Main Street in Albemarle. I had replenished inventory on Thursday. Thank you, Lord. Count your blessings. Have a Happy Holidays, Ladies and Gentlemen. I’ll keep you posted on my progress.